When is the puppyhood over? I didn’t get home last night til 8 pm, so I heated up the vegetarian version of beanie weenie (vegetarian baked beans and a tofu dog, in case you wanted the recipe) for dinner and was at long last sitting down to eat. Goldie was outside doing whatever she does out there. Lately, she has been trenching the yard, searching for non-existent gophers. (What gopher would be stupid enough to move into a yard where Goldie lives? No gopher, that’s who). Does not stop her. Then I heard a noise from under the floorboards. Not a mouse, not a rat…a wagging tail noise. Huffing and puffing noise. I said about 43 swear words. 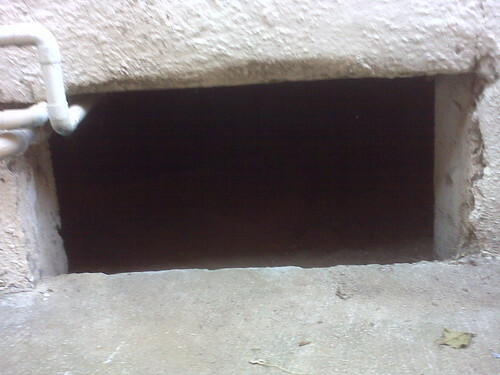 The dog had gotten under the house. I do not have a basement. I live in a one-story bungalow with two big steps up to the front door. There is only one way to get under there and it is usually blocked off, but the landlord had been over trying to fix the plumbing (that’s a whole ‘nother blog post) and had left the screen off. The hole is only about a foot high but that was apparently enough for Little Miss Spelunker Hound. Which is how I found myself at dark-thirty on a Thursday night lying on my side on the concrete, my head halfway through a spider-webby hole, shining a flashlight under my house, listening to my dog rampage around. Let me remind you that this dog is, according to her paperwork from the dog pound, 15 years old. Way too old for this nonsense, in other words. I couldn’t see her but I could hear her. She didn’t sound hurt or stuck, just excited. She could apparently move about fairly freely, even though she is a good foot taller than the highest part of the under-house space. What she wouldn’t do is come near me. I couldn’t call her because she is deaf. I couldn’t tempt her with food because 1) I’m a vegetarian who is also completely out of cheese and 2) When she is hunting, you could put a raw juicy steak in front of her and she wouldn’t even give it a sniff. Dog is busy. So I lay there, pointing my flashlight around the dark, occasionally catching a glimpse of tail or a flash of shining eyeball, completely unable to help the dog or to pull myself away in case she needed the light to see by or in case she got stuck…in which case, I don’t know WHAT I could have done – take an axe to the floorboards in the general area where I thought she might be? I truly do not know. After about 45 minutes, when my hips were good and sore from lying on concrete, she came commando-crawling out, panting so hard she sounded like a steam train. I greeted her and…she immediately turned around and headed back into the hole. I lunged and grabbed her collar and pulled her away. I put the grate over the hole and blocked that side of the house with some yard junk so she couldn’t get back there again. I brought her into the house, where she drank about a gallon of water and then scratched at the door, trying madly to get back out. No. No, dog, no. It occurred to me that Goldie wants to hunt more than I have ever wanted anything in my life, ever. Am I doing something wrong, or will that kind of desire just leave me crawling into dark scary spaces, too? Well, at least she’s healthy and active. I blame the landlord. Puppyhood is never over. That’s one of the nice thing about dogs. Yes, Goldie believes in having fun, that’s for sure.